Favourite Friday: the February 18th edition – virtual NYFW, polka dots & Arcade Fire? L-A: Want to know something? Four days with the same headache is three days too many. Sheesh. What’s a girl got to do to get some relief around here? Okay, let’s focus on favourite things and maybe get my mind off my aching head (unlikely, as they are rather attached to one another). It was Fashion Week again! That’s a total favourite. And my favourite thing about it was the designers who put their shows online for those of us who (a) cannot get to New York, and (b) couldn’t get into a big deal show even if they could get to New York. I managed to catch Marc Jacobs and Proenza Schouler shows. And unlike the big deal people who attended them (I spied the likes of Grace Coddington at both and HRH Anna Wintour at the latter), I didn’t have to brave winter to see them. Instead I watched from the armchair in my office. Okay, I’ll admit it. Given the option, I’d totally schlep through the snow to go to the shows. But I like to tell myself that I got the better deal. My favourite thing about the shows is that they’re online to be watched. Big golf claps to designers for making fashion accessible, even if their prices aren’t. Did I love all the designs? Nope. 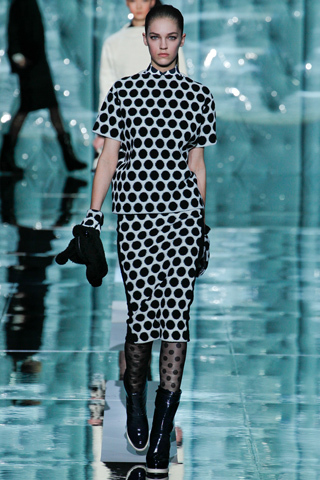 But I did enjoy some dresses and jackets at PS and the polka dots and pencil skirts at Marc Jacobs. oh heyyy…can I have you for whatever job I get when I graduate? My other favourite thing of the week happened when Arcade Fire won a Grammy. First off: Arcade Fire won a Grammy! Second: Apparently the interwebs doesn’t know who Arcade Fire is. Which brings me to this favourite tumblr: Who is Arcade Fire? Third: Did you know Lady Antebellum is not one lady? Maybe I can make a “Who is Lady Antebellum” tumblr. I mean, come on! Who doesn’t love a slouchy hat and a giant scarf? I don’t know if that tumblr is making fun of the people who don’t know Arcade Fire or not, but it fills me with the kind of glee that only comes when I get to feel smug for having better grammar and better taste in music. Have a good weekend…I know I will. I’m kicking off “reading week” today. And while I do have school work to do, it is also called “sleeping in until at least 9am week”. p.s. Don’t forget: only one week until Oscar Party!